I don’t have to tell you that Content Marketing is important for your business. You’re here reading about it, which probably means it’s top of mind for you. Whether you’re actively engaged in a content marketing program or trying to figure out where to start, you understand the opportunity. 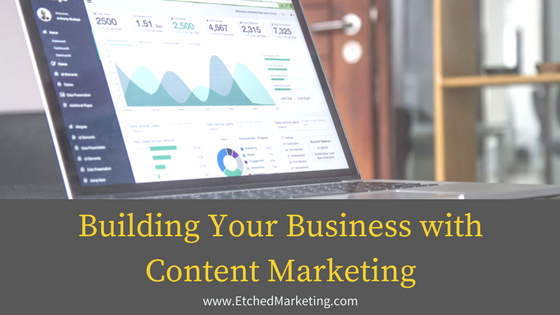 Do you know how to build your business with content marketing though? There are so many ways you can benefit. If you’re not already actively blogging, now is the time to get serious about it. If you have a blog but you’re letting it languish because you don’t have the time or resources to devote to it… it’s time to reconsider that strategy. Blogging is honestly one of the biggest opportunities for businesses today. What other tactic can you use to drive brand awareness, build your website’s authority, increase keyword rank, and ultimately drive traffic and revenue? And, it’s essentially a free channel. You have the option of doing it all in house or hiring an agency or freelancer to oversee your blog strategy and manage it. You can reap all the benefits of blogging and stay completely hands-off, if you have the right team in place. Your customers want to read blogs. 29% of customers said they want to see more blog content this year. Blogging consistently leads to better sales and more earned links for your website, which we know leads to an increase domain authority and keyword rank. Websites with blogs have an average of 434% more indexed pages and the more pages indexed, the more leads generated according to this study. In fact, companies that blog 11x or more per month see 4x the number of leads than those who only blog 4 times per month according to Hubspot. Adding a blog and consistently creating new content can help your business grow in many ways. From an increase in authority and keyword rank, to an increase in traffic and leads, blogging really is a powerhouse tool that you should be using in your marketing efforts. Want to learn more about why blogging matters? Read this post. Curious what a great blog post looks like? Check out this post. Social Media marketing can help expose your business to thousands of new customers in a short time-frame. By using the content you’ve created for your blog and sharing it with your fans and followers, you can drive traffic, leads, and revenue. Blog Post A is written and read by 100 people. 10 people think Blog Post A is so engaging or helpful that they share it with their friends on Facebook. The average Facebook user has 338 friends (source). Your blog post that originally only had 100 readers, now has been shared with 3,380 people. If 10% of those people share your blog post (338), your content now has the potential to be viewed by over 100,000 people. 114,244 to be exact. And that’s just one post and one social network. Now, if you’re wondering if people really want to share information on Facebook, they do. In fact, 46% of users cite the ability to share with lots of people at once as one of the main reasons they use Facebook according to Pew Research. When you create content that your customers need and want, they’re going to be inclined to share it and when they do, they help build your business for you. And when they share your content, they’re helping to build your business for free for you. You don’t have to spend money to boost a post or buy social media advertising, unless you want to. You can do it all organically. Facebook, Twitter, YouTube, Pinterest, LinkedIn, and Instagram all draw millions of visitors each day. Depending on your brand and your target market, one or all the social channels will work for you. If you find a post is performing well organically, it might make sense to boost it with some paid media support but it’s not a requirement for success. You can build your business completely by providing great content that your customers need. You don’t have to rely upon paid advertising channels. In fact, content marketing on average, costs 62% less than traditional outbound marketing channels and drives 3X the leads according to the Content Marketing Institute’s research. It’s easy to see why content marketing is a focus for so many companies. It can be directly correlated to growth in brand awareness, traffic, authority, keyword rank, and leads. It should be at the center of any marketing program. If you’ve tried content marketing but haven’t seen this type success, don’t give up. Maybe it’s time to hire a professional to help you achieve your goals. Yes, it can all be done for free but sometimes, it’s best to hand the tasks over to a team you can trust and have them drive the strategy for you. If you’re interested in learning more about our content marketing offerings, contact us. We’d love to help you achieve the type success we drive for other clients. We know content works because we’ve seen it many times. Let us help you achieve your goals and have content marketing drive your business too. Originally published at www.etchedmarketing.com on May 30, 2017.